In a Nutshell: Seeing how unimaginative the coupon industry in India had become, Ashok Reddy decided to use his technical expertise and business knowledge to change that. He founded GrabOn, a coupon site for India that focused on user experience and innovative features, like BUZZ, which uses AI to send coupon alerts directly to consumers, and a responsive mobile app that can help users get deals no matter what app they are using. Beyond GrabOn, Ashok’s latest project is a comparison site called BestPriceOn which shows the best prices on any given product throughout India. Ashok’s dedication has helped make GrabOn the top coupon site in India and has reshaped the savings industry in the country. Having worked for Microsoft, eBay, and PayPal, Ashok Reddy had plenty of experience on the technology side of globally successful businesses in markets that were saturated with both users and talented employees. He even worked his way up to become the CTO of a startup called IncentOne, a growing health and wellness company that engaged consumers through rewards. 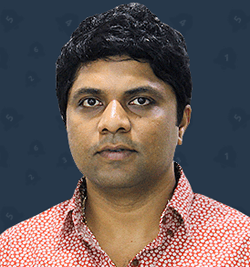 Ashok Reddy, Founder of GrabOn, talked with us about the coupon site’s innovative strategy. But in 2011, he moved back to India to take care of his ailing mother and had to make a fresh start with his career. He found that breaking through would take more than just a technical skill set. He wrote a hospital patient management app after seeing massive inefficiencies in the process up close while taking his mother to appointments. The people he showed it to thought it was a great idea and well-designed app, but believed it was too early for India to adopt that type of technology — and most hospitals wouldn’t provide the information needed to make it work. So Ashok moved on, and eventually found another idea, one that was a little outside of his comfort zone at the time: a coupon site called GrabOn. 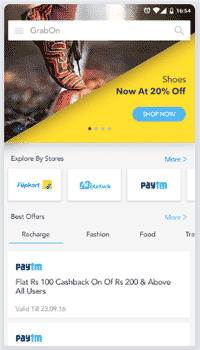 While most coupon sites in India were generic — their names all starting with the word ‘Coupon’ — Ashok decided to make his site stand out with a unique name and focus on the user experience. Ashok was proud to launch GrabOn in September of 2013, just 59 days after ideation, but he soon realized the site had its share of growing pains. Ashok used his own money, not investor cash, to fund the relaunch, which allowed the team to focus on what mattered most — the user experience. The site began growing exponentially, and the company became profitable in a short eight months. The massive traffic eventually led to GrabOn building a new state-of-the-art office — once again without the help of outside investors. Ashok also knew that once GrabOn solidified its user base and traffic, he could move on to an area which he was passionate about — technological innovations. Once GrabOn became India’s top coupon brand, Ashok saw more opportunities to further expand by developing innovative features to draw even more users. GrabOn introduced BUZZ, a real-time mobile notification system built with AI, in July 2015, and the feature was a big hit in India. BUZZ tracks what users frequently buy and when coupons are available and — through machine learning — pushes alerts directly to them. GrabOn’s dedication to improving the user experience was the impetus for creating a feature like BUZZ, as was the analysis of what users wanted. “Because we have the traffic, users, and audience, we can say, ‘We are an innovative company, we know exactly what you want, what you’re looking for’ and we can build that,” Ashok said. 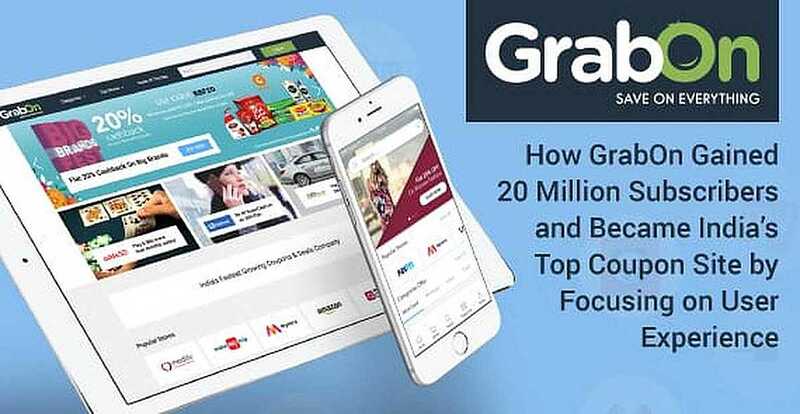 GrabOn also offers a browser extension to automatically find and apply deals as well as a mobile app that goes beyond serving coupons to actively show users better offers on products or services for which they are currently searching. For instance, if you are in a ride-sharing app, and GrabOn knows of a better rate being offered by a competing ride-share platform, an alert is pushed to show users the better deal. Responsive alerts are just one of the reasons the GrabOn mobile app has 250,000 downloads in the seven months since its launch — without any money spent on user acquisition. But the innovations don’t end with GrabOn features, Ashok continued to look for ways his company could expand its authority in the savings space. To save consumers time when shopping around for the best price, Ashok and his team developed an India-specific comparison site called BestPriceOn.in, which finds the lowest price on items ranging from phones to refrigerators. And since the site uses artificial intelligence, its search results are much more intelligent and accurate. Through AI, BestPriceOn can decipher some of the more complicated searches and produce results that are relevant instead of just returning products that fit each keyword. The feature makes it simple for users to get the price comparisons they need without having to be a search terminology expert. The company’s dedication to innovating in the coupon space has not only earned it users but also plenty of accolades. “In the last year or so, we have received 12 awards — including the IBM Start-Up Star Award in 2016 — because of the growth we have had and the kind of innovation that we bring in,” Ashok told us. When Ashok started GrabOn, his goal was to make a coupon site for India that differentiated itself through improved user experience and advanced features that other sites couldn’t match. The fact that the company was bootstrapped — not VC funded — and accomplished its growth organically only add to its uniqueness in the industry. Ashok’s dedication to innovation, like GrabOn’s BUZZ alerts, the brand’s intelligent mobile app, and the development of comparison site BestPriceOn, has propelled his company forward. And the people of India have rewarded his efforts by making GrabOn the top coupon destination in the entire country.